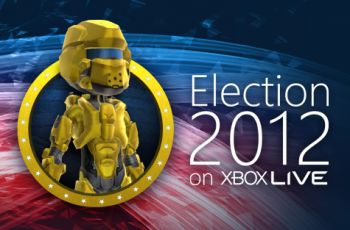 Watch the presidential debates on XBL, get Halo avatar armor. Even if your primary form of conflict resolution involves two armored, hulking space marines with preposterous alien weaponry, you may want to tune into the upcoming presidential debates on Xbox Live. These quiet, reasoned, nonviolent discussions of presidential policy may not have the same kind of raw impact as standard Halo deathmatch, but Microsoft wants to attract fans of the bestselling sci-fi franchise just the same. If you register for Xbox Live Rewards and watch three of the four debates, you'll receive exclusive Halo 4 armor for your avatar. This initiative is part of Xbox Live's "Election 2012" coverage, which aims to get gamers involved in the U.S. political process by polling them for opinions on the candidates, helping them register to vote, and broadcasting the presidential and vice presidential debates live. With three presidential debates on October 3, October 16, and October 22, and one vice-presidential debate on October 11, gamers can choose to watch any three for half an hour apiece. A token for the Halo 4 Warrior Armor will arrive in their inboxes around the beginning of November. Leaving aside the tenuous connections between political involvement and a bright yellow set of space armor, this is a novel way of rewarding politically active people while hopefully drawing in a less-informed crowd that might just learn something. Since this offer works for all Xbox Live Rewards members, people in other parts of the world can tune in, too, but listening to Obama and Romney go at it for an hour and a half might not be as relevant as actually getting a few rounds of Halo in.